The sequel to the 2014 blockbuster action thriller starring Keanu Reeves explores the secret society that supports the world of assassins. Once more directed by Chad Stahelski from a script by Derek Kolstad, it is filled with the same non stop one man against everyone. It's brutal and excessive, and all out enjoyable. 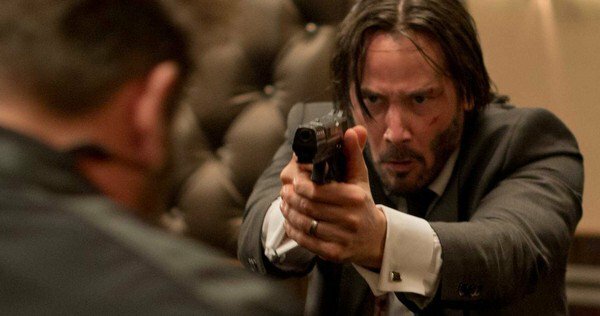 John Wick wanted to quit but was forced back in when some punks stole his car and killed his dog. Now he has a new dog, but now everyone thinks he back in the game, especially after he tracks down his Mustang and destroys everything that gets in his way. Enter Santino D’Antonio (Riccardo Scamarcio) who forces Wick to do a job because he holds a marker for his services. D'Antonio had helped Wick get out, but now wants him to assassinate his sister. Gianna (Claudia Gerini), Santino’s sister is being elevated to the "High Table", the governing council of crime lords. Santino believes that he is more deserving of the spot. He promises Wick that his Marker would be fulfilled and he will be free after the job is done. At first Wick refuses and Santino burns down his house. A marker means that he has to fulfill the debt or die. So Wick is off to Italy where he checks into the Continental in Rome, the assassin hotel franchise where no business is allowed on the property. They offer services such as a sommelier who has a nose for weapons, a tailor who specialized in bulletproof suits, a person who gives him maps and plans of the catacombs the run under the city so Wick can find his target. The action explodes afterwards as Cassian (Common), Gianna’s chief bodyguard seeks revenge for his ward, and Santino's hench men led by mute security enforcer Ares (Ruby Rose) are sent to "tie up loose ends". Of course, Wick gets away, so Santino tells him that he's now forced to avenge the death of his sister. He opens an account which is how they set up their assassination jobs. The office is full of old type of computers and switch boards with pencil skirted women who handle all the paperwork. They send out a text message for every assassin in the New York area for the 7 million award. Apparently every other person is a secret assassin. He seeks the help of Laurence Fishburne as The Bowery King who Wicks at one time damaged but let live in order to find Santino while dodging people trying to kill him at every turn. The battle in the museum full of mirrors is one of the best sequences full of glorious balletic violence. There has always been a cinematic attraction to the stoic gun fighter of few words. The John Wick series has raised the bar with it's realistic bone crushing fight scenes and no slow mo gun battles. The well choreographed action is a thing of beauty despite the body count. Fortunately, the cliff hanging ending sort of demands another chapter, hopefully soon.